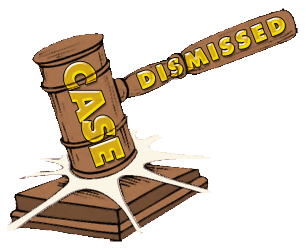 The Definitive Case Dismissed Radio Article and Log with Carlton KaDell. Case Dismissed was developed as a public service to frame "the story of your legal rights." 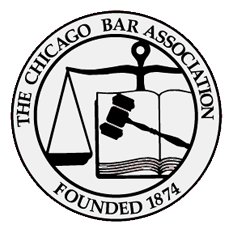 It was produced in cooperation with The Chicago Bar Association and employed John Fitzgerald, Dean of Loyola University Law School as both host and advisor to the series. A local production of WMAQ AM/FM, NBC's network affiliate in Chicago, the series ran for thirteen weeks during the Spring of 1954. The production employed local talent for the most part. 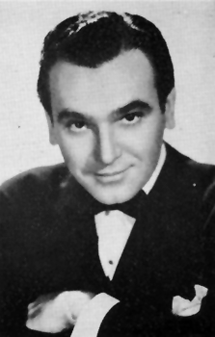 Carlton KaDell, who started his Radio career in Chicago, starred in most of the productions. The remainder of the casts were comprised of WMAQ employees, local Chicago artists, and WMAQ's own production staff. While it's tempting to label this series a Public Service Announcement, it was far more than that. Most of the scripts very cleverly portrayed every right way--or wrong way--to approach a range of legal matters that might concievably affect any American. After resolving the script one way or the other, the Host, John Fitzgerald, would dissect the legal issues involved in the script, point listeners to the right source of legal information--for the State of Illinois, in any case--and suggest alternate scenarios, as time permitted, to further illustrate the larger issues behind that week's topic. As a local presentation, WMAQ's production of Case Dismissed acquitted itself very well indeed. With few exceptions, the enacted legal issues were realistically depicted, thoroughly explored, and informatively resolved. The exposition for and resolution of these programs was never preachy, overly complicated, nor left unresolved. Each story had an arc that was resolved for that particular combination of legal issues and choices. The listener was never left hanging. Mindful of the fact that Case Dismissed was being heard in many other states besides Illinois, the program regularly reminded its listeners that the problems presented and legal remedies offered were based only on then current Illinois Law. But it's also clear that because they were mindful of a larger audience, the producers and writers very helpfully selected a broad range of legal topics that were general enough in nature to present useful choices and information to residents in virtually any state that might be listening in. All told, a fascinating, useful, and well mounted series of legal dramas that accomplished precisely what they set out to do for thirteen weeks. So effectively, in fact that the basic legal tenets put forth within most of these thirteen episodes remain almost universally applicable today. Run Dates(s)/ Time(s): 54-01-23 to 54-04-17; NBC [WMAQ]; Thirteen, 30-minute programs; Saturdays, 5:30 p.m.
Musical Theme(s): Ironically, the closing theme of this series about the law and lawyers, is a recording of a Dmitri Kabalevsky composition called "The Comedians"
The most helpful provenances were the log of the RadioGOLDINdex and newspaper ads. The most inaccurate reference was Martin Grams' Radio Drama. Grams, for example, utterly disregarded one entire episode--#11, Small Business Problems. We point it out to underscore the folly of using hearsay or anecdotal sources as reference points. The titles we've employed for our log are the actual titles or, in this instance, topics announced in the credits for each episode in circulation--as corroborated by the intro to each respective episode, itself. Mr. Grams would have heard what we heard, we're certain. Herein lies the major difference between vintage Radio preservation and 'otr'. Radio preservationists not only listen to what they log and archive, they look forward to it. Listening to great Golden Age Radio is what we do here. So it's kinda like a busman's holiday in many respects. [UPDATE] - Nov. 28, 2010. Apparently Martin Grams, noted OTR author, has responded in an OTR forum, inaccurately citing us as a "commercial interest." This, in spite of the fact that on every single page of our articles we post both our sources and state flatly that anyone with more definitive proof or more helpful sources is more than welcome to contribute them to correct our articles or findings. We actually do our own research and--the one step Mr. Grams demonstrably omits himself--we actually listen to what we log. We have no idea where Mr. Grams obtained all of his information for Radio Drama. He didn't cite any of it. The fact remains that Radio Drama contains no reference whatsoever to #11, Small Business Problems. And of course it's regrettable that Mr. Grams' Radio Drama is so often inaccurate--we both plopped down $95 for our own copies. We've since become wiser in the process and we're not too proud to admit that we both erred in purchasing it. But simply having purchased Radio Drama doesn't oblige either of us to overlook its shortcomings. It is--and remains--a significantly flawed reference. We're commited to publishing the most accurate information we can obtain (e.g., sources we can freely verify for ourselves or hear) to update our findings. Indeed we've helped Mr. Grams personally on several occasions where he'd apparently forgotten what he's already published in his numerous 'authoritative' OTR publications--and he thanked us for reminding him. We've yet to hear personally from Mr. Grams' on Case Dismissed. We're right here on the Internet for anyone to find us, correct us, disabuse us of misinformation or contribute to what we offer by way of proof and due diligence. Our addesses and phone numbers are all over the site and in all of our public Internet records. We have nothing to hide. All rights reserved by their respective sources. Article and log copyright 2010 The Digital Deli Online--all rights reserved. Any failure to attribute the results of this copywritten work will be rigorously pursued. 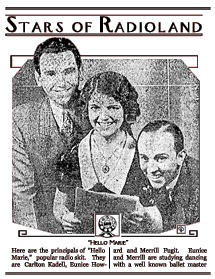 Announcement of Hello Marie from 1932. April 3 1937 Carlton KaDell article. Carlton KaDell was born, raised and educated in Indiana. While still a child he was reportedly already appearing in tent shows and Chautauqua repertory shows. Leaving school for the stage, KaDell was working steadily in vaudeville, lyceum productions, tent shows, repertory stock companies and had returned to the above mentioned Chautauqua repertory productions. While still in his teens he was working with later Radio star Tim Ryan in his Ryan and Noblette stage troupe. By 1927 and 1928 Carlton KaDell was appearing regularly in legitimate stock company productions throughout the Midwest. Soon after arriving in Los Angeles, Carlton KaDell was hired by Carl Laemmele, Jr. to work as a contract player for Universal Pictures. When not actively involved with a picture, KaDell coached Summer Stock presentations on the West Coast. 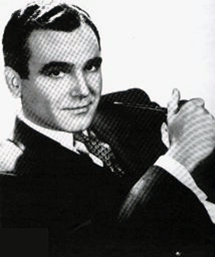 By 1934, Carlton KaDell had already established himself as a reliable announcer and dramatic co-star. He had his chance to debut as a Radio lead twice in 1934: First in Mystery Drama for Rocket Gasoline and then as Tarzan in Tarzan and The Diamond of A'Sher for Signal. 1935 and 1936 found him announcing for Grace Moore, Hollywood Hotel, Strange As It Seems, and Tarzan. 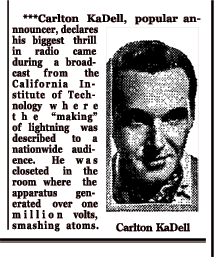 1937 brought Carlton KaDell another opportunity to co-star in Thrills, an adventure anthology. 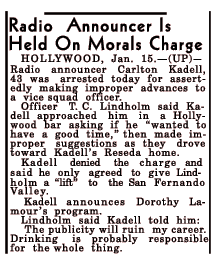 1937 was also the year that KaDell would begin a nine-year, on-again, off-again gig announcing for Amos 'n' Andy. KaDell wasn't just acting, announcing and coaching during this period. 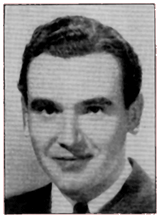 1937 also found him collaborating with another announcer over his first published book--"Stars of The Antennae"--which was to recount their personal and professional impressions of the famous Radio stars with whom they'd already worked on coast-to-coast programs. Continuing to announce several programs during the late 1930s, KaDell was by then working on The Chase and Sanborn Hour (1937), Amos 'n' Andy, Big Town (1937), Silver Theatre (1938), and both coaching and performing in Summer stock. Carlton KaDell found another lead opportunity in Wings of Destiny (1940), starring as Steve Benton, the heroic pilot of the series. This would seem to be a recurring theme in KaDell's career since, if we skip ahead thirteen years, we find KaDell portraying Radio's last Sky King (1953). 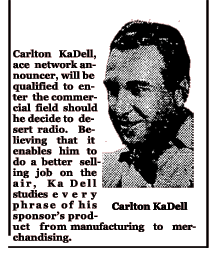 As it was, during the intervening 1940s, Carlton KaDell found himself very busy as an announcer on some of Radio's most popular programs. 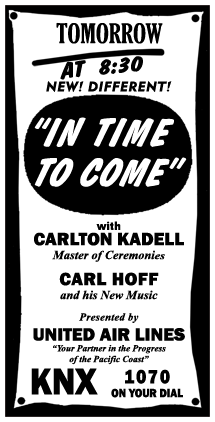 Kadell announced Kay Fairchild Stepmother (1941), Backstage Wife (1941), both Melody Tours and Studebaker Tours (1942), In Time To Come (1943), This Is My Story (1943), The Al Jolson Program (1943), the American Meat Instutute season of The Life of Riley (1944), Mail Call (1945), The Jack Carson Show (1944), The Cases of Mr. Ace, Your Movietown Theatre (1948), and Sealtest Variety Theatre (1948). He also appeared in acting roles throughout the same period, notable among them, Family Theatre (1948) and Let George Do It (1948). The 1950s found KaDell venturing into other lead roles in adventure programs, such as Armstrong of The SBI (1950) and, as mentioned above, Radio's last Sky King (1953) . KaDell was also tapped to lead Erle Stanley Gardner's 'other' mystery program A Life In Your Hands (1951) in the role of Jonathan Kegg. To Carlton Kadell packing a bag comes naturally, be it in real life or as new star of KBWD-Mutual's "Sky King" adventures (Tuesdays-Thursdays, 5:30-5:55 p.m.). His non-fiction pattern of migration fits him well for the many trips he's taking in the role of the Arizona rancher - crime fighter. Starting in Los Angeles in a radio series, he moved to Chicago with a road play. A year in the Windy City as an announcer and singer and Kadell was back on the coast where he stayed in radio for several years. Then it was on to Chicago again for three years before returning west. Now he's in Chicago anew. Actually, Kadell likes moving about since he has a hobby of rebuilding old houses, always picking quarters needing repair or reconstruction. He's yet to select an igloo for a residence, but strangely enough one might be more appropriate since he also collects miniature penguins. When not sawing, hammering, announcing or acting, Kadell takes part in summer stock or plays a round of golf, a game of tennis or goes swimming. Hair-raising experiences in "Sky King" will do little to equal one Kadell had many years ago in Los Angeles. When an earthquake hit the studio, Kadell kept on acting, ducking falling plaster, until a power failure halted the broadcast. KaDell rounded out his Radio career by returning to his Radio career's roots in Chicago. During that period he performed in--or announced--Destination Freedom (1951), Hello, Sucker! (1952), and Case Dismissed (1954).